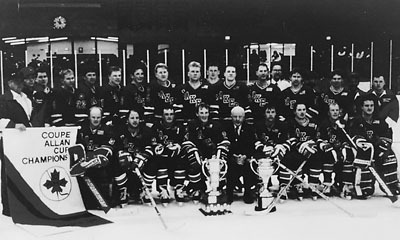 During the period from 1993-94 to 1995-96, the Warroad (Minn.) Lakers accomplished a unique triple by winning the Canadian senior hockey championship and the Allan Cup three years in a row. The 1994 championship among four teams was played in a new arena in Warroad. Lakers finished the round-robin with a 2-1 record after losing 7-5 to their CASH League rivals, the St. Boniface Mohawks. Lakers then shut out Stony Plain, Alta. 4-0 to get another shot at the undefeated Mohawks, a team they had beaten 12 of 13 times during the season Using a completely US-born lineup, the Lakers won the Allan Cup with a 5-2 victory. In 1994-95, Warroad played in the Southeastern Manitoba Hockey League. The Allan Cup was played in Stony Plain and the Lakers won their first two games over Powell River, B.C. and the host hometown Eagles. The victories put Lakers into the championship so a 9-5 loss to Truro, N.S. didn't hurt. In the final against Stony Plain, Lakers led 3-0 in the third period and managed to hold off the Eagles for a 3-2 win. It was only the sixth time in the history of the Allan Cup that a team won back-to-back championships. The following season saw the Lakers given "the pink slip" by the Southeastern Manitoba League so the team played an exhibition schedule until the Manitoba playdowns. The team won a fifth straight provincial title. By beating Lloydminster Border Kings in the Manitoba/Saskatchewan playoff, Warroad earned a spot in the Canadian final to be played in nearby Unity, Sask. Lakers won three straight in the round-robin and then beat Stony Plain 6-1 in the final for Canadian senior title number three. Team Members (1994, 1995, 1996): Playing Coach David Marvin, Scott Knutson, John Hanson, Jared Baines, John Gillie, Bruce Elson, Todd Kriebich, Greg Lund, Shane McFarlane, Jamie Byfuglein, Roger Lein, Vince Huerd, Denny Fry (Board member in 1996), Manager Cal Marvin, President Jim Cass, Board Members Spencer Estling, Frank Marvin, Stu Weston. Other Players: Mike Ross, Steve Ross, Larry Olimb, Wyatt Smith, Steve Johnson, Darin Olimb, Dan Marvin, Chris Imes, Matt Knox, Derick Ewald, Clay Hahn, Ted Brickey, Donnie Reindeau, Dale Lund, Todd Kemball, Wayne Bartley, Shawn Pomplun, Billy Lund, Sandy Gasseau, Aaron Novak, Bryan Lundbohm, Adrian Hasbargen, Keith Stewart, Kaine Martel. Board Members Dave Gray, Mike Larson.